Unsubscribe from email newsletters and other bulk email in Gmail without installing any browser add-ons. Would you recommend Gmail Unsubscriber to a friend? @garytokman But first delete your account on Unroll.me, so they'll delete your history! In unroll.me, there's an option in settings. @andrewwarner Thanks! CTRL + Q (CTRLQ.org) is a popular keyboard shortcut to close the web browser. The idea behind the site is that you spend less time with tech and more time doing things you really love. @labnol I've been following you for years and love the way you work, but the meaning you just described is not easy apparent, esp since it's all caps. And on a mac it's Command + Q Here's what I freakin' love about your work: 1) you create insanely needed tools that others don't think about. The gmail tool that lets me forward old emails is insanely useful. I used it to get old feedback emails into an Evernote notebook to share with my team. 2) you give the freakin' scripts 3) you do killer explainer videos for your work. Step by step. Simple. Clear. No wasted words. You don't talk down to the viewer, but you never assume that people understand more than they do. 4) your posts have as few steps as possible, but no fewer. The one for this unroll me alternative is a great example: https://www.labnol.org/internet/... Most people are going to blow through this product like it's just another thing on PH. I want them to know that an artist made this tool. The person behind this is more than a 1-hit wonder. Your work is phenomenal. I've watched you make useful tools and write helpful posts for years. More people need to know. @andrewwarner @labnol Well said Andrew! @andrewwarner You made my day Andrew. Can't thank you enough! @andrewwarner he is one of the few bloggers from India who made a living out of blogging. Open source alternative to Unroll.me written with Google Apps Script. 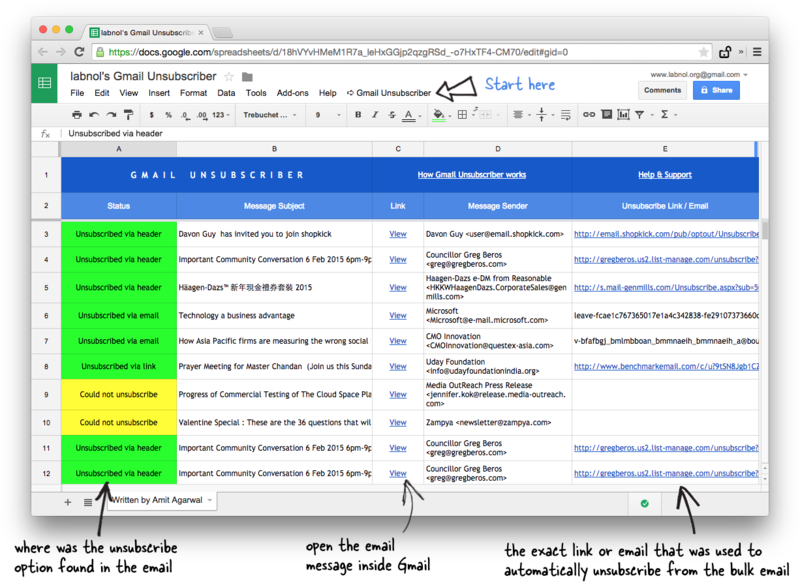 Let you unsubscribe from email newsletters in Gmail with the help of a Google Sheet. Here's a step by step guide on how to use Gmail Unsubscriber. https://www.labnol.org/internet/... 1. Go to Gmail and add the label Unsubscribe to one or more bulk emails that you wish to unsubscribe from. 2. Open the Google Sheet, go to Gmail Unsubscribe and Configure. The script will run in the background, every 15 minutes, and auto unsubscribes from mailing lists that are labeled Unsubscribe. @labnol I keep some email newsletters that I do not want to unsubscribe from. Is there a way I can avoid unsubscribing from all emails? @3raxton @labnol Don't label them with the label "Unsubscribe". As I understand it, these are the only ones parsed for unsubscription links. Nice. Unroll.me got me a little worried of all the free services I use. I've been using Amit's script for a year now. It's especially useful when I'm on mobile - I don't have to click the unsubscribe link in an email, open my browser and then unsubscribe. I just move it to the Gmail folder and I'm done! Love it. Are there alternative services to unroll.me that will bundle emails into a regular digest?